HUNTINGTON – While the state prioritizes increasing Vermont’s stagnant and aging population, some residents are raising their voices against what some are calling “climate refugees.” As coastal regions become more dangerous, some are already leaving their homes and moving to landlocked, mountainous areas like Vermont, and as the global climate worsens these numbers are expected to increase exponentially. 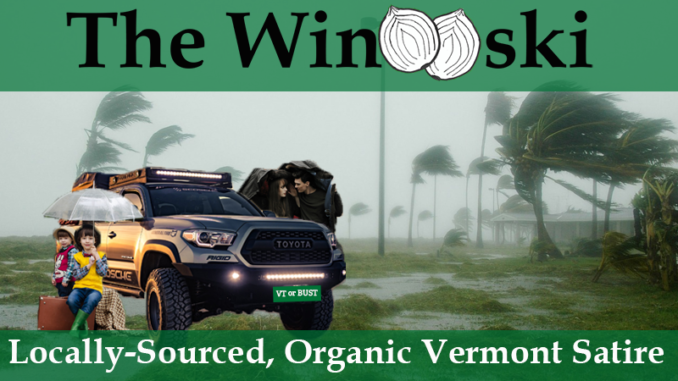 Huntington resident Bronwyn Goodpeace, who moved to Vermont in 1969 from New Jersey, is not happy about the potential influx of “wetlanders” and has organized a group hoping to slow, if not stop, the oncoming deluge. Goodpeace formed Aging Hippies Against New Development, Jobs, or Business (AHANDJOB), which she says is not against the people themselves that may be trying to move to Vermont, but rather is opposed to any new infrastructure that may be proposed to support them, such as housing, schools, or economic centers. AHANDJOB has been criticized by some Vermonters as being hypocritically composed primarily of “flatlanders who already ruined the state,” but Goodpeace doesn’t see the comparison as valid. In the coming months Goodpeace hopes to recruit more members, and says that anyone looking for AHANDJOB should contact her directly rather than googling the information, as there have a been a few complaints regarding common search results. Google has so far not responded to complaints from the group regarding its algorithim.